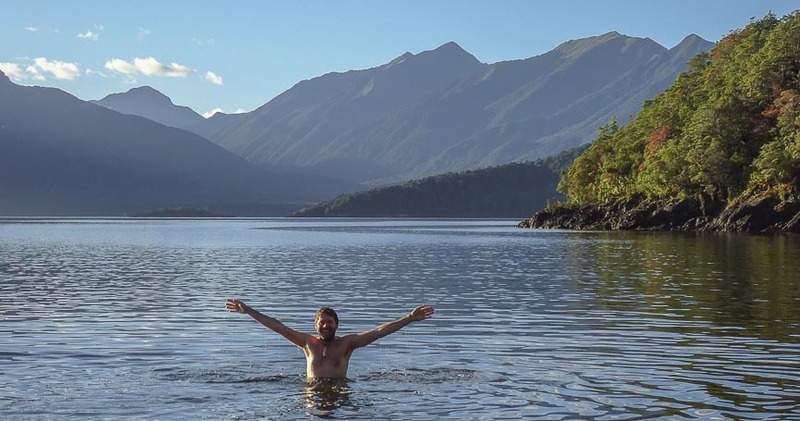 If you like to swim in mountain lakes, then you will love Te Anau and Manapouri. We often have long hot summers that are perfect for family trips to the beach. And what could be better after a day's tramping, kayaking or running, than to dive into our pure mountain lakes? And if you think that no-one would be mad enough to do this in winter you're wrong; the local Te Anau primary school has a fundraising "polar plunge". We're a tough lot in Fiordland. In the middle of summer top athletes swim the whole width of the lake in our annual lake swim. See our events pages for more information. Lake Te Anau is the largest body of freshwater in Australasia, a stunning lake with three deep arms spreading west like fingers into Fiordland. There is a popular swimmingarea to the north of town near the boat marina. Along the Kepler track, which runs along the lake edge for 5.6km, there are beaches at Dock Bay and Brod Bay. These can be reached on foot, or alternatively hop on the Kepler water taxi from Te Anau; phone Steve on 03 249 9364. Swimming in cold water is meant to be very good for your health. 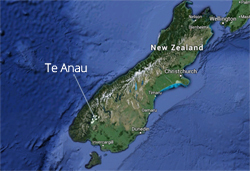 Or so the Search and Rescue team in Te Anau tells us. They have set up a brilliant club to teach and practise cold water swimming in lakes, with a marked training area between the yacht club and the Department of Conservation Visitor Centre, with white painted boulders every 100 metres. This is a friendly club set up for social reasons, but also an opportunity to recruit into the Search and Rescue Team, which rescues people from our lakes, fiords and coastline. Call Jared on 03 249 7179. Lake Manapouri (connected to Lake Te Anau by the mighty Waiau River) is popularly described as the most beautiful lake in New Zealand. Its beautiful sandy beaches and deep blue waters can make you feel like you are on a pacific island, not deep in the south of New Zealand. Frasers Beach right next to the village is a lovely family beach. However the most picturesque beaches in Lake Manapouri are undoubtedly reached by boat. So hop in a kayak or go on a lake cruise to reach them. Our lakes are great playgrounds but it is important to remember safety first. It takes only a few seconds to get into trouble and drown. The coldness of our lakes away from the shores can easily cause hypothermia even if you are able to swim. And beaches often shelve away from very shallow water to very deep water. If you have young children who cannot swim, make sure you watch them at all times. All children using a play boat should wear a proper life jacket (not a swimming pool-standard buoyancy aid which might not hold a child's head above water). Life jackets can be bought in Te Anau at Outside Sports on the main street. Never swim in areas used by motor boats.